Our 2011 Yucatan Cave Expedition was a huge success. We were able to accomplish much more than we thought we would and I will be posting a more thorough update next week sometime. Until then, I wanted to thank everyone involved and give a very special thanks to those that sponsor us. I have often been asked about the gear I use and the gear our team uses. I will point out a few of the things we use. The dive lights we use are always Light Monkey. These lights are ROCK SOLID and can burn through the nastiest of cow dung runoff infested cenotes! Our team uses both LED versions as well as HID versions of Light Monkey dive lights. Personally, I dive a 21W HID with a 10 aH or 18 aH LiON battery. For dry caves, the only lights I trust to get wet, take a beating and still work time after time are from Princeton Tec. I use the APEX as a primary and an EOS as a backup. The new APEX is actually 200 lumens; mine are only 60! I am thinking about upgrading but I hate to get a new light when mine are still working. Worth some special attention is my new wetsuit. It is from a Florida company called Wet Wear. I had seen these suits before and knew I wanted one but wow, I didn't realize one wetsuit could really be any better than another. I have never been more wrong! The Wet Wear suit is custom fitted and made of G-231N nitrogen blown neoprene. Initially, I wanted a 5mm but they great people over there convinced me that a 3mm version of their suit is like everyone else's 5mm. They were right! The deal with this neoprene is that is does not compress. Another cool feature is the zippers. You can see in the picture to the left that the arm and leg zippers are very long. This suit takes about 5 seconds to put on. I know I am droning on but if you are in the market for a new suit you owe it to yourself to check out Wet Wear. Lastly, the ever true Armadillo! In my opinion, if you are going to dive sidemount (vs. simply carrying tanks on your side), this is the only rig that is even worth looking at. In the picture above, you will see that I am wearing my climbing harness under my Armadillo. All I do is get on rope, drop the pit and start diving. I don't need to make any modifications and everything works and fits flawlessly. The Armadillo was made for expedition but works everywhere! I dive it on expedition and here in Florida, I dive it anywhere. Thanks again for these great gear manufacturers and the great products they build. 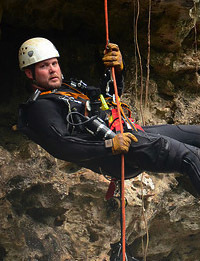 Stay tuned for more updates on the 2011 Yucatan Cave Expedition. If you have any questions about the gear I use just send me a note from the Contact page.